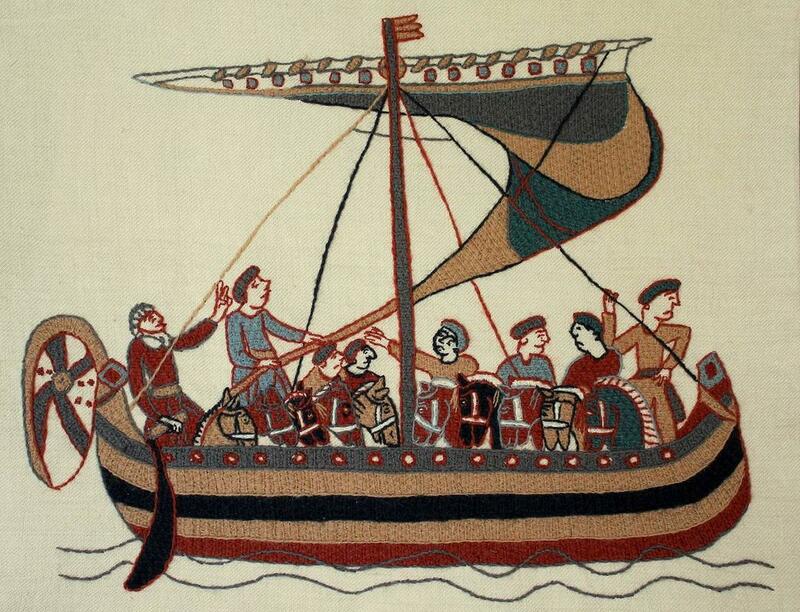 Taken from the Bayeux Tapestry, the oldest known piece of Crewelwork, and most probably stitched in England, the boat is worked in Bayeux stitch in a range of Appleton's 2-ply crewel wools to resemble as closely as possible the original colours from the Bayeux Tapestry. It is worked on pure linen twill fabric. You are invited to join us on a relaxing weekend away in the lovely village of Alstonefield. The programme is designed to allow you maximum stitching time, but at the same time incorporating breaks for refreshments, short talks, and simply to give you opportunity to relax, including short walk(s) around the village as you wish! You may want to continue sewing during the evening at home or at your accommodation, but this is not obligatory! ﻿Read the outline programme with timings here.﻿ The course is limited to 13 persons. The project is suitable for beginners to Bayeux Stitch and Crewelwork. Bayeux Stitch is made up of only 3 stitches and is a relatively straightforward stitch to complete. Sunday: 9.00 am - 4.00 pm. Tea, coffee & home-made biscuits will be served each day in the morning. All materials for the embroidery are included in the price. The design measures 14" x 11" and will be pre-printed onto your linen twill measuring 20" x 17". Equipment is provided for your use during the weekend, including a 17" x 14" hand held clip frame to hold your fabric. If you prefer to use your own frame, please bring one large enough for the project. An upholstered frame with pins would be suitable, but an embroidery hoop is not suitable. If you have your own slate frame and would like the fabric in advance to prepare, please contact me to arrange collection. Individual lights will also be available for your use over the weekend. Read the complete list of what is included here. You will part-complete your embroidery and learn all the stitch elements that make up 'Bayeux stitch'. You should leave feeling confident to be able to finish it off your embroidery at home. You will be shown how to wash, stretch and finish your work. £160 per person, including all materials and refreshments as listed above (accommodation is not included and should be booked separately - click here for a link to accommodation). Read the complete list of what is included here. £50 non-refundable deposit is required at the time of booking, or 9 months before the workshop if sooner.